This easy homemade pasta salad recipe can be prepared in minutes and is a super dish for spring. However, we must admit we love eating it all year round! Hot pasta is absolutely divine, however, during the spring it’s hard to resist the urge to exclusively eat fresh meals, like this super homemade pasta salad. With the temperature rising, we can’t help but daydream about cool, scrumptious recipes. So, we got pretty inspired and just had to share this recipe from Five Heart Home. It’s easy enough to take to work and delicious enough to impress at a potluck. And if basil and cherry (or grape) tomatoes bring you to your knees, sheesh, you must try out this recipe — it’s to die for! Boil tortellini in salted water according to package directions. Drain and cool. 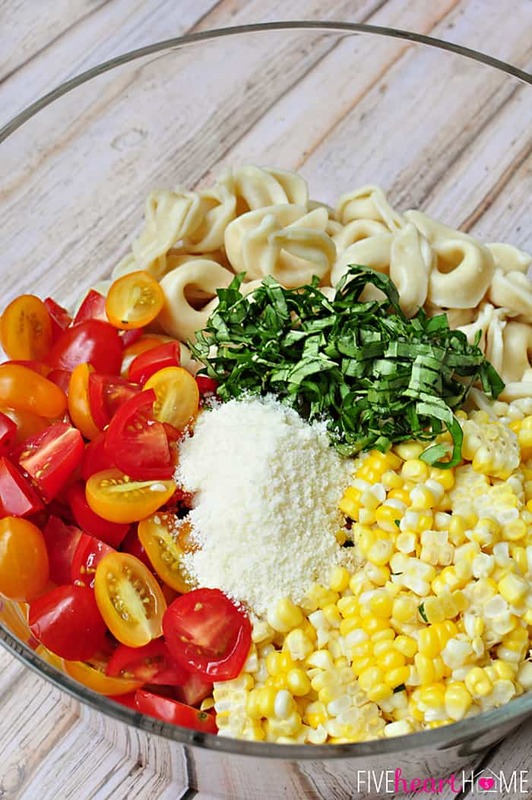 In a large salad bowl, combine tortellini, sliced tomatoes, fresh corn kernels, fresh chopped basil, Parmesan cheese, and pepper. Combine all vinaigrette ingredients in a jar with a tight-fitting lid. Shake vigorously. 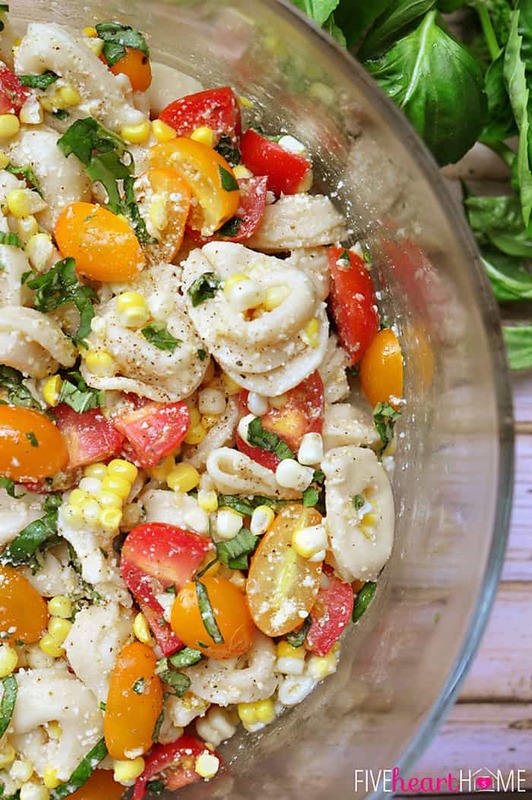 Pour over tortellini salad and gently mix all ingredients until well combined. Chill for several hours before serving. Feel like making your way to the grocery store yet? Take note that all recipes fare best with ultra fresh ingredients, so don’t you dare turn to the frozen food section to pick up a bag of corn — make sure you go directly for those ears of corn, nothing will compensate for that extra crisp and crunch. Let’s get cookin’ and start eating healthy, folks. Did you enjoy this homemade pasta salad recipe? Let us know in the comments section below what troubles you had or what you did differently with this homemade pasta salad recipe. Want another quick and easy salad recipe to try your hands on? Check out our Mason Jar Salad Recipes! This post was originally published in December 2015 and has been updated for quality and relevancy.